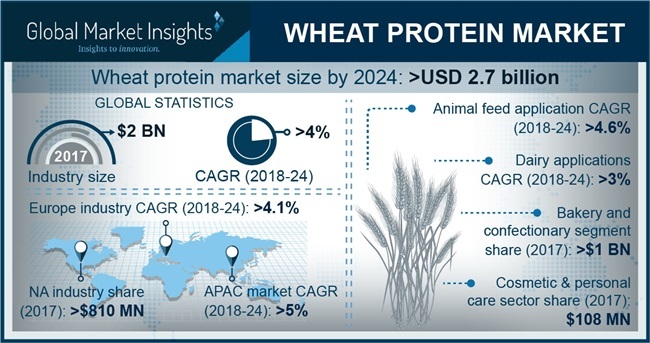 Wheat protein Market size is estimated to exceed USD 2.7 billion by 2024; according to a new research report by Global Market Insights, Inc. Rising consumer awareness pertaining to healthy lifestyle maintenance and growing lactose intolerance cases globally will fuel the demand for vegetarian nutritious products. Increasing plant-based food products adoption for reducing the risk of obesity and diabetes will proliferate wheat protein market size. Increasing manufacturers focus for enhancing promotions of organic & vegan food items among the targeted consumers owing to the inclining consumer preferences towards vegetarian diets will augment the wheat protein market size. Large raw material availability at comparatively low cost is among the major factors propelling the companies to invest in gluten items resulting in the business expansion. Increasing population will play a vital role in shaping the market growth. As per the United Nations Department of Economic and Social Affairs, the global population is expected to reach approximately 8.5 billion by 2030 resulting the need for affordable & healthy sustainable food products. Surging demand for crops & cereals enriched with clean nutrients including gluten will provide a positive outlook for the wheat protein market over the forecast period. Numerous organizations are engaged in product development from plants derived gluten. For instance, International Wheat Gluten Association works with food technologists for product innovation and research of various food applications to improvise nutrition, appearance, cost, and food flavor. Substantial changes in the consumer lifestyle along with the packaged foods and RTE products adoption including pasta & instant noodles will drive the overall wheat protein market growth. Upsurge in the sports nutrition sector owing to the rising demand for high performance energy drinks and nutritious food products will stimulate the wheat protein market. As per the Global Food Forum’s seminar in 2017, plant-based nutrients is being increasingly adopted by professional bodybuilders as an alternative to whey. In addition, growing consumer awareness pertaining to the benefits of nutritional supplements will be a key impetus for manufacturers to introduce novel products. Wheat gluten market will witness sales over USD 1.1 billion by 2024. Surging health & fitness awareness among the consumers in Asia Pacific & North America countries will drive the demand for nutritional products, energy drinks, and health supplements. Numerous athletes and sportspersons primarily need adequate protein amount for complete body nutrition in daily exercises, practice performances, and training regimes hence influencing the product demand. Hydrolyzed wheat protein market is projected to observe over 3.1% growth in the forecast period from 2018 to 2024. Increasing demand for organic & natural personal care products such as masks, shampoo, body moisturizers, and hair conditioning will boost the product application scope. Wide utilization of the ingredients owing to its nourishing advantages associated with improved hair & skin health will augment the product portfolio. Moreover, increased utilization as an emulsifying agent in the cosmetic products production will promulgate the overall industry growth. Bakery & confectionery applications accounted for over 55% revenue share of the overall wheat protein market. Upsurge in the consumer spending for instant food, beverages, and RTE products are the major drivers fueling the product demand. Unstable raw materials and complex production process for baking require value-added ingredients such as gluten to improvise elasticity and stability. Dry form market accounted for over 550 kilotons in 2017. Key properties of the dry form including convenient measuring, low contamination probabilities, and better stability will be a key impetus for the growth of the total wheat protein market. In addition, rapid insurgence in the bakery and confectionary industry owing to the rising demand of the food products among children will further support product landscape. Asia Pacific is anticipated to witness a CAGR at over 5% from 2018 to 2024. Increasing demand for plant-based cosmetic products owing to the rising consumer awareness pertaining to the key product health benefits will propel the regional industry growth. Rapid urbanization & technological advancements coupled with low labor costs across numerous countries in the region will provide competitive edge for several manufacturing companies. Key market players include Agrana, Roquette, CropEnergies, Archer Daniels Midland, and Tereos Syral. Companies are into product portfolio expansion and new product development for novel applications. Other prominent industry players are Glico Nutrition, MGP Ingredients, Manildra Group, Agridient, and Kerry Inc.